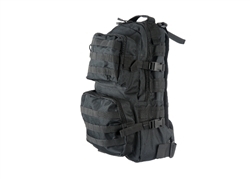 Lancer Tactical MOLLE Multi-Purpose Backpack in Black is a versatile backpack designed for short day trips or long range traveling. It features a plethora of compartments and pockets to store and organize anything you might want to bring. Made out of tough 600 Denier nylon, the backpack features one large main compartment, and two additional compartments on its front face. Additional MOLLE panels are provided on the front and side faces to attach any other accessories you might want to bring along with you. The shoulder straps are padded and can be secured along with an additional sternum strap while additional support can be used by using the waist strap built-in to the backpack itself.